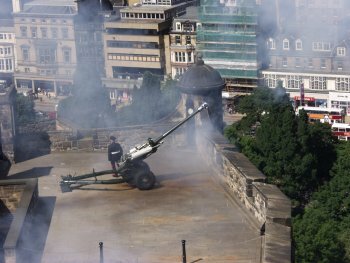 An old ritual with a practical background is taking place every day at precisely one o'clock: The One O'clock Gun is fired. When exact timekeeping started to become important people needed something to ensure they could set their clocks correctly (televisions and radios, not to mention the telephone didn't exist yet). 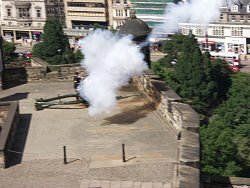 So the One O'clock Gun was implemented, which is fired at exactly one o'clock. As sound travels fairly slow, there were even maps showing how many seconds had to be deducted to set a clock correctly if you weren't close enough to the castle. 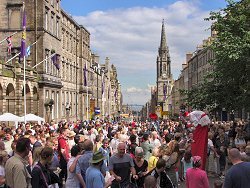 From the castle I made my way down the Royal Mile, trying to avoid the leaflets for hundreds of Fringe events people tried to give me constantly. 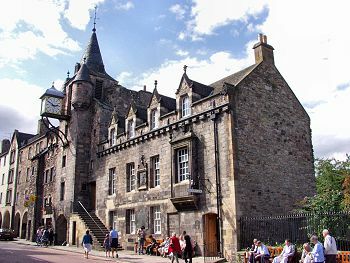 I stopped at Canongate Tolbooth to visit "The People's Story", an interesting exhibition about the everyday life and work of the people of Edinburgh through the centuries. 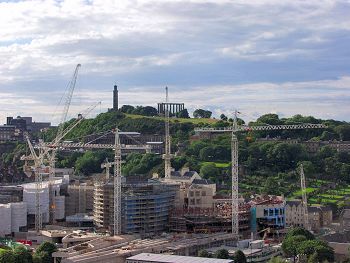 At the other end of the Royal Mile the new Scottish Parliament is currently being built. 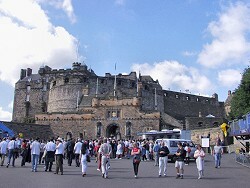 A visitor centre gives an overview about the history, the plans and how the construction is progressing. 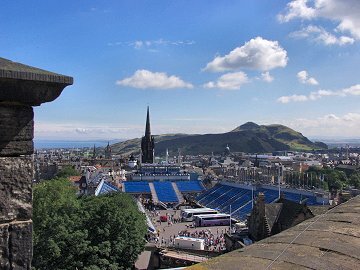 The best view over the site is probably from the Salisbury Crags at Holyrood Park. 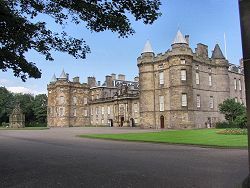 Next to it is the Palace of Holyroodhouse, the Official Residence of Her Majesty the Queen in Scotland. 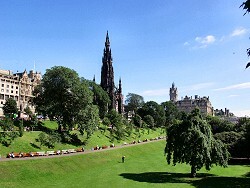 It's hard to believe, but the picture on the left is taken from a spot may be 200 yards from the Scottish Parliament Building. 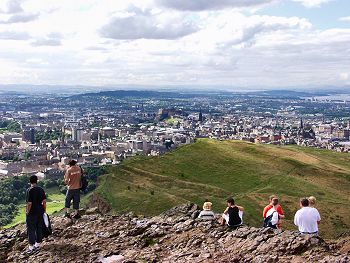 Arthur's Seat is an extinct volcano just a short distance from Edinburgh City Centre. 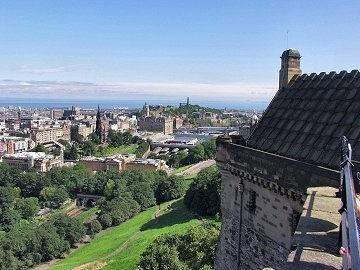 I decided to make the climb up to it's 250m/820ft summit to enjoy the views over the city and the Firth of Forth. 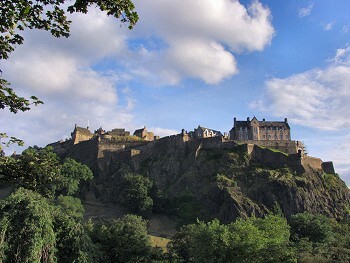 The climb is not too strenous and it's worth it, the views are fantastic. 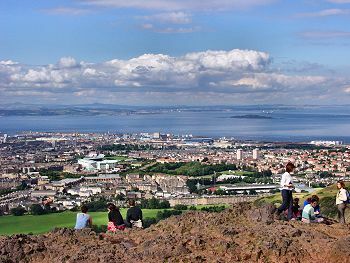 The weather was fairly clear and I could see as far as Fife on the other side of the Firth of Forth or the Forth Rail Bridge. 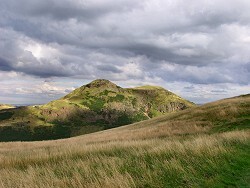 I spent quite a while at Arthur's Seat and in Holyrood Park, just enjoying the views and the sunshine. In the evening I made my way back to the station to take the train back to Stirling.